Making exercise fun again, NordicTrack exercise bikes offer good value at very affordable prices. As with their popular treadmills and ellipticals, you get a lot of features and capabilities, more so than on any other comparable exercise machine. NordicTrack is a subsidiary of ICON Health & Fitness, the world’s largest manufacturer of fitness equipment. They also own the ProForm, Weider, FreeMotion and Weslo brands, but NordicTrack remains the most popular. The company’s products, including exercise bikes, treadmills, rowing machines and ellipticals, are sold in retail sporting goods stores as well as online. The very latest models can be found on the company website, which also features some of the best deals you'll find. The company currently produces nine exercise bikes: two recumbents, two uprights, two new Grand Tour spin bikes and two Commercial Studio cycles, all well designed and quite affordable. Prices range from $599 to $2,399, with a model for everyone regardless of fitness level. If you order directly from NordicTrack’s website, you will get Free Shipping as well as special sales that they have throughout the year. The GX 4.4 is the base model in the series and features a 5" backlit display, 16 lb. flywheel, 25 resistance levels to choose from, iFit technology, pulse heart rate monitoring, 30 built in workouts and a 300 lb. max weight capacity. Additional touches include OneTouch controls for easy adjustment, oversized cushioned seat, AutoBreeze fan, water bottle holder and transport wheels. This is the newest bike in the series, replacing the previous GX 4.6 Pro. The VU 19 gives you all of the features of the GX 4.4 plus a 7" Smart HD touch screen, a heavier 19 lb. flywheel, two additional workouts, a higher 325 lb. max weight capacity and a stronger warranty. Check out the entire lineup on sale now at the NordicTrack Store! The base VR21 recumbent model features a 5" backlit display, 20 lb. flywheel, 25 resistance levels, iFit technology, pulse heart rate monitoring, 32 built in workout programs and a 350 lb. max weight capacity. Additional touches are similar to those on the upright NordicTrack exercise bikes: OneTouch controls for easy adjustment, oversized lumbar supported seat, AutoBreeze fan, water bottle holder and transport wheels. The up-level VR25 has everything the VR21 has, adding a 7" Smart HD touch screen, a heavier 25 lb. 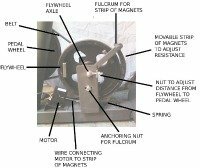 flywheel, one more resistance level, three additional workouts and a stronger warranty. The base Grand Tour indoor cycling bike has a 7" Smart HD touch screen, iFit Coach technology, 16 lb. flywheel, 24 resistance levels, incline and decline capability, oversized seat, adjustable pedals, 32 built in workouts, a 350 lb. max weight capacity and comes with 2-3 lb. dumbbells. You also get an adjustable tablet holder, workout fan, Bluetooth heart rate monitoring, water bottle holder, OneTouch controls and transport wheels for easy mobility. The advanced Pro model gives you a larger 10" Smart HD touch screen, two additional resistance levels, 3 more workouts and a higher 375 lb. max weight capacity, as well as a free wireless chest strap. The in-studio feel can only be experienced on the new NordicTrack commercial studio cycles. They come in two models: the base S10i and the up-level S22i. 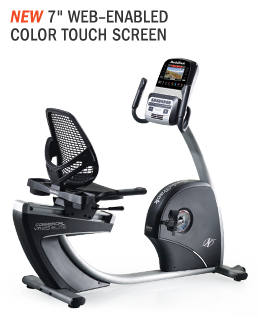 The base model gives you a 10" Smart HD touch screen, Watts power meter, speaker system, more incline and decline capability than the Grand Tour series, OneTouch controls, commercial grade construction, tons of adjustment capability and dumbbells included. The advanced studio cycle gives you everything the S10i model has plus a larger 22" Smart HD touch screen and a stronger warranty. NordicTrack exercise bikes share many of the same frames and models as ProForm models, since both are made by ICON Fitness at the same manufacturing plant. If you can’t find a good price on a NordicTrack model you want, chances are a similar bike will be available from ProForm with a different paint job and decals for about $50 less. The warranties from ICON Fitness are much better than they were in years past – with lifetime frame coverage on most models – so that's a step in the right direction. Which NordicTrack Exercise Bike Should You Choose? When it comes to choose a NordicTrack exercise bike, you first need to decide which type of bike you are looking for and what your budget is. The Upright Series is the least expensive, and puts you in the same position as you would be on a spinning or outdoor bike. If you like the typical home exercise bike experience, then one of these models will be just fine for you. Here the GX 4.4 Pro has a lot of great features, but we would opt for the up-level Commercial VU 19 if you can swing the additional $400, as you get a nice touch screen display, smoother ride and a year of iFit included in the price. If not, the base mode is just fine. The Recumbent Series is a little more expensive than the upright NordicTrack bikes, but now you're in a seated position which takes a lot of stress off the back and joints. If you prefer to sit, or you are rehabbing an injury, these might be a better choice for you. Here again we like the upgraded model, the VR25, for the same reasons why we prefer the upgraded upright bike. The Grand Tour Series is like the studio bikes you find at your gym, giving you much more of a racing outdoor feel. They are more expensive than the uprights and recumbents, yet have a lot more to offer. Here you can choose either one depending on your budget...the 7" touch screen on the base Grand Tour is perfectly fine. You don't need to pay an additional $500 for a larger touch screen, unless that's something that really appeals to you. The Commercial Series is awesome for sure, but you don't necessarily need that for your home unless you will be hitting it pretty hard every day, or there are multiple users in your household. 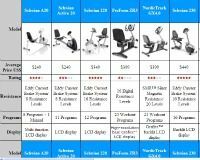 At around $2,299 for the base S10i model and $2,999 for the S22i, it's a bit expensive for a home exercise bike. But again, if money is no object, these are pretty dang cool. See the latest bikes and special current sale pricing here! NordicTrack Commercial Studio Cycles - the latest exercise bikes competing head to head with Peloton to provide in studio classes with professional trainers. NordicTrack Grand Tour - the newest model introduced in 2016 with incline/decline capability, iFit and lots of workout programs. NordicTrack Grand Tour Pro - a more advanced model with a larger touch screen, more workouts and increased resistance levels. NordicTrack GX 3.5 Sport - an entry level indoor cycling bike at a very affordable price...a solid choice for beginners. NordicTrack GX 5.5 Sport - a step up from the 3.5 with a wireless chest strap for heart rate monitoring and more features. NordicTrack GX 4.4 Pro Upright - A well-priced bike with iFit technology, a ton of workouts and a high level of adjustability. NordicTrack Commercial VU 19 Upright - An upgraded version of the 4.4 with a web-enabled touch screen and more workouts/resistance levels. NordicTrack Commercial VR21 - A solidly built recumbent exercise bike with iFit, 32 built in workout and 25 resistance levels. 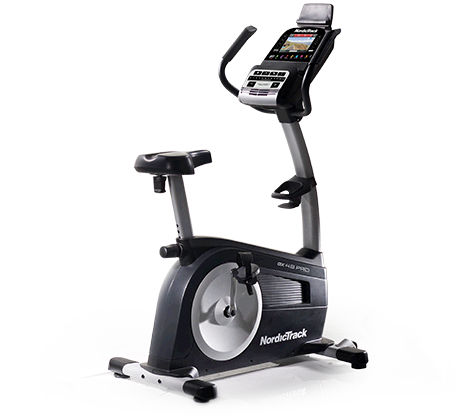 NordicTrack Commercial VR25 - An improved version of the VR23 with more workouts and a web-enabled touchscreen.